Reciprocating air compressor or a rotary screw air compressor? A breakdown of factors to consider when deciding between a reciprocating air compressor and a rotary screw air compressor. When deciding whether to install a new engine driven air compressor or change your existing design, it’s important to understand operating characteristics, capabilities and limitations of the two alternative air compressors commonly considered. To help you understand how this decision affects your engine and your application, we’ve put together this review of the most common differences between reciprocating air compressors and rotary screw air compressors. First, let’s talk about how each compressor works and then we’ll break down the benefits of reciprocating compressors and rotary screw compressors. 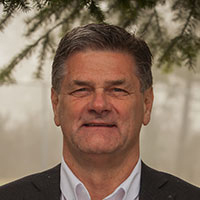 On typical reciprocating compressors, used on some OEM equipment, the compressor is driven by a stand-alone diesel or gas engine, or is hydraulic-driven, and operates continuously while the engine is running. Reciprocating compressors may also be referred to as piston air compressors. Piston compressors are typically driven by the diesel engine either by a direct-drive through an auxiliary engine port or by a belt drive system and operate continuously while the engine is running. The compression cycle is usually controlled by an unloading mechanism and—in some cases—a governor. If a governor is used, it is most likely mounted on the compressor. The function of the governor is to maintain the system air pressure specific cut-in and cut-out pressures. As the piston is drawn down in the cylinder, a vacuum is created between the top of the piston and the cylinder head. This causes lower pressure atmospheric air to enter the cylinder through a set of inlet valves above the descending piston head. During this cycle, the inlet valve is open and the discharge valve is closed. As the piston moves into an upward stroke, the inlet valve closes, trapping a volume of air in the cylinder. This area in the cylinder is steadily reduced as the piston moves within the cylinder. This creates air pressure. Once the air pressure in the cylinder overcomes the spring resistance on the discharge valve, the valve lifts off its seat, allowing the pressurized air to evacuate the cylinder and the cycle is repeated. When the discharge valve is closed, it acts as a non-return check valve as well, blocking pressurized air from returning to the lower pressure area within the cylinder. The air that leaves the discharge port has a low-frequency pulsation which must be smoothed out before the compressed air is usable in down-stream equipment. This is accomplished with the use of an air receiver tank. Once the air pressure in the air receiver tank has reached the high-pressure cut-out point, the pressure control device being used sends a signal to the compressor to unload. Depending on the compressor design, this can be accomplished in a number of ways (full unloading or partial unloading). As compressed air is used down-stream, the pressure sensed in the receiver tank will start to fall. As it falls to the cut-in (load) point set on the control mechanism the compressor returns to the compression cycle and delivers air under pressure to the air storage tank to rebuild the tank pressure. The duty cycle of the compressor is based on the difference between the time it spends fully or partially loaded to the time it runs fully unloaded or shut off entirely. Reciprocating compressors are typically designed to run fully loaded between 20 – 30 percent of the time and the rest of the time to be unloaded. Compressors designed with these duty cycles can experience high degrees of increased maintenance or outright failure should the designed duty cycles frequently be surpassed. Most of the damage is heat related. Some of the reasons for exceeding the duty cycle would be under sizing the compressor for the application and excessive air leaks anywhere in the system (this would be equivalent to additional load). If the compressors do not unload as recommended, there will most likely be a breakdown of the compressor lubricant due to high temperature. This will result in excessive wear of the many components in this design of compressor. In some designs of engine driven reciprocating compressors, the drive engine sump provides a portion of its supply of lubricant to the compressor. This supply becomes an integral part of the engine lubrication system. The lubricant recommended change out schedule would change from the standard recommended by the engine supplier without the addition of the compressor, as the engine supplier would have to take into consideration the heat load transferred by the compressor to the engine lubricant, in order to determine the reduced life expectancy of the engine lubricant. Typically, in an engine driven air compressor application, the portion of the lubricant being cooled by the engine oil cooler and then recirculated to the compressor would be the primary source of cooling to the compressor. Secondarily, the air flow from the engine oil cooler fan would tend to remove some of the radiated heat from the body of the compressor and carry it away with the exhaust air. Without these cooling methods, and in the event of application exceeding the designed duty cycle of the compressor, it would be very difficult to maintain air temperatures limitations to within the factory specifications (both of the compressor and the engine cooler). Increased temperature of the lubricant beyond recommendations could lead to a premature breakdown of the lubricant resulting in more frequent lubricant changes or, failing that, premature failure of moving parts within both the engine and the compressor. 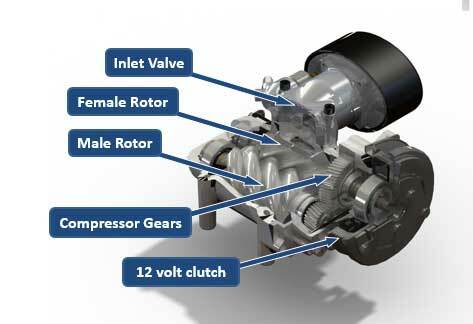 Rotary screw compressors can be powered by a variety of methods. They can be driven via a belt or coupler from an engine, driven by hydraulics or direct-transmission, or even powered by an independent gas engine. Rotary screw compressors are oil injected have their own self-contained lubricating system and do not share oil from the engine. *VMAC’s rotary screw compressors include the VMAC Lifetime Limited Warranty. Rotary screw compressor systems have a closed loop oiling system that performs 4 main functions. These components can be combined assemblies or separate components. Atmospheric air enters the screw compressor through the inlet air filter. The air then travels through the inlet valve which can be a load-no-load type or a modulating poppet type inlet valve. Air enters the rotor assembly and compression begins as the rotors mesh at the air inlet end of the compressor housing. Air is drawn into the cavity between the male rotor lobes and the female rotor flutes. As rotation continues, the rotor lobes pass the edges of the inlet ports, trapping the air in a cell formed by the rotor cavities and the cylinder wall. Further rotation causes the male rotor lobe to roll into the female rotor groove, reducing the volume and raising the pressure. An oil mist is injected at a point in the compression cycle to seal the clearances between the rotors and between the rotors and the casing, which results in higher compression. This oil mist also removes the heat of compression and lubricates the rotors and bearings. Compression continues until the rotor lobes pass the edge of the discharge port and release the compressed air and oil mixture. cools the compressor as it carries away the heat of compression. The oil leaving the compressor is very hot and must be cooled before being re-injected again. The oil starts out in the oil separator/ reservoir tank. The oil is forced by air pressure through the lubrication system. When the compressed air-oil mixture leaves the compressor, it flows into the separator/reservoir tank which is where the first stage air-oil separation occurs. This tank also acts as the oil reservoir. From the air-oil separator/reservoir the oil will flow through an oil cooler (either liquid to liquid of air to liquid). The oil cooler is necessary as the heat of compression is absorbed by the oil and needs to be cooled before it is injected back into the compressor. The oil also flows through an oil filter, on its way back to the compressor. The secondary air-oil separation is completed through a coalescing filter which removes the remaining oil mist from the air. 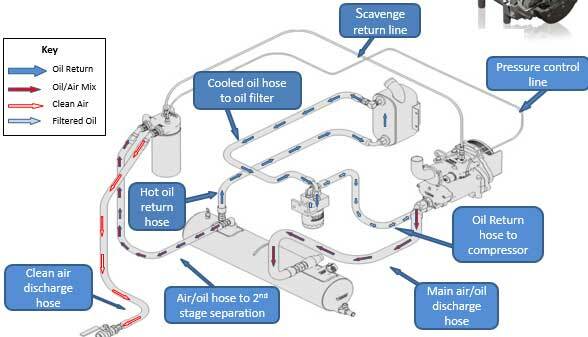 Oil removed (scavenged) from the air by the coalescing filter is returned to the compressor via a small oil return line or scavenge line. The pressure line helps control the inlet valve/governor to control air flow in the compressor system. 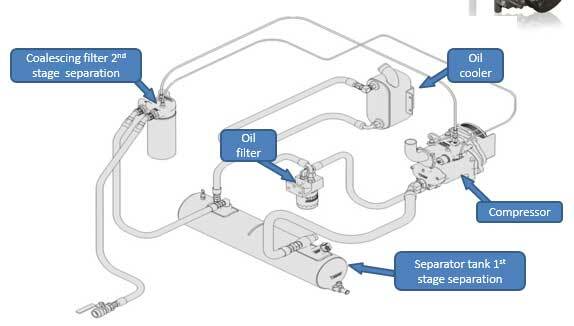 *(There are a number of air-oil separator/ oil filter configuration options available, this image shows one variation). As mentioned above, the duty cycle of the compressor is based on the difference between the time it spends fully or partially loaded to the time it runs fully unloaded or shut off entirely. Due to the rotary screw compressor design and the very low comparative oil temperatures vs a reciprocating type compressor, the screw compressor is designed as a 100% duty cycle compressor. For applications requiring over a 25% duty cycle, a rotary screw compressor is recommended. As shown, the reciprocating and rotary screw compressors are different although ultimately doing the same job; delivering compressed air. When choosing, installing or sourcing a compressor for your application, considering these differences may help with determining the best option for you.